Kadaknath is a native breed of poultry inhabiting Jhabua and Dhar districts in western parts of Madhya Pradesh. Kadaknath birds do not fatten and retain lean body formation. The dark colored meat is considered a delicacy. 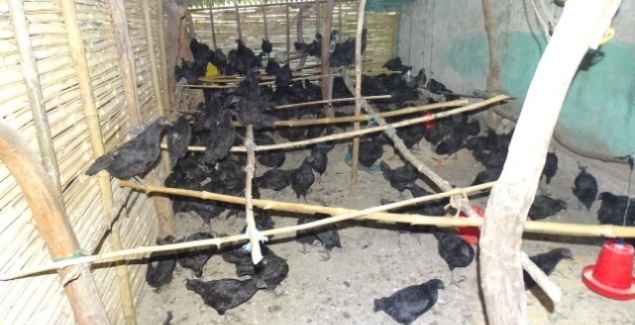 Kadaknath birds command a higher price in the market as compared to other breeds. They are priced between Rs 800-1000 as compared to desi birds with a price range of Rs 350-400. Even though they were known to be reared by tribes people for a long time in the past, slowly vanished from the homesteads in the area. There is a Kadaknath breeding unit at the Krishi Vignan Kendra at Jhabua that supplies 28 day old chicks at a unit rate of Rs 60 per chick. As part of the project initiative, support was given to selected households that were interested in rearing Kadaknath birds. The purpose was to promote native breed among the rearers and also to avail the advantage of a higher income for the farmer. The support included the cost of purchasing 50 chicks and a shelter for the birds. A total of 57 units of Kadaknath chicks were initiated. Poultry has emerged as a significant income generating option. The increased number of birds has also resulted in increased sales and consumption at home. Backyard poultry farming remains important for rural households, as it ensures a steady flow of high quality food and thereby mitigates malnutrition. Also the additional cash income, reduces vulnerability. There has been an increase in the consumption of eggs and as well as birds. There were more number of households with bigger flock sizes and the number of birds consumed has also increased. Women are closely associated with poultry. 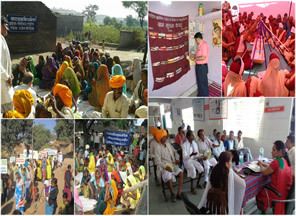 It was also reflected in the process of engagement in the project which was based on women self-help group members organised into poultry extension groups and women murgi sakhis as service providers. In all the villages, it is the women who took the initiative to rear Kadaknath birds. They were solely responsible for the feeding and management of the birds with minimal or sometimes no support from other household members. The money generated from sale of birds gave them power and freedom of decision making to spend on books and fees for children’s education. It also brought leadership qualities of women to the fore.